=DXA= allows anyone with an ordinary browser anywhere to see updates about the expedition activities, particularly the radio log, in nearly real time. For instance, within 60 seconds of your contact with VKØEK, the browser page is automatically updated to show your callsign at your location, and confirmation of your contact in the log. =DXA= is a relatively simple application that runs on a separate computer at the DX location that is connected between the logging computers and the satellite link. It is essentially a daemon that watches the radio logs but does not modify the logs in any way. Data copied from the logs are uploaded to the central website and used to generate the graphics on the client browser. Anyone with an ordinary browser can watch as the screen is automatically updated once per minute with the activities of the previous minute. You do not have to refresh your browser--it does so automatically each minute. It also totally prevents losing a valid contact due to a pirate (unauthorized) station. What will I learn by watching DXA? By watching =DXA=, you will get confirmation of your QSO within 1 minute after you make it, and you will be able to confirm your previous QSOs. You will see the logging activity of the DXpedition, so you will get a sense of the rotation of propagation around the world. You will see the bands and modes the operators are using in real time. You will be able to zoom the map to any location and watch the QSOs being made in that area. You will see messages that may provide specific information of value to you and your colleagues. You will be able to click on a link to send an email to the team onthe island. You will see how much time remains before the DXpedition goes QRT. And you will be able to click on a link to request your QSL cards. All this comes on a single web page that needs no installation, no software, in fact no interaction at all. Just watch it. But we'll bet that once you start, you won't be able to take your eyes off it! Has DXA been used before? Yes, for K7C (Kure, 2005) and TX5K (Clipperton (2013). In both DXpeditions the =DXA= site attracted about 40 million hits. It is so popular that we believe it will eventually become a standard for major expeditions. A survey taken after the 2005 K7C DXpedition is available here. The results of a questionnaire are here. Some comments on the benefits of real-time log posting are here. A brief recounting of the ARRL policy on real-time log posting is here. Should I watch DXA during VKØEK? Well...yes! 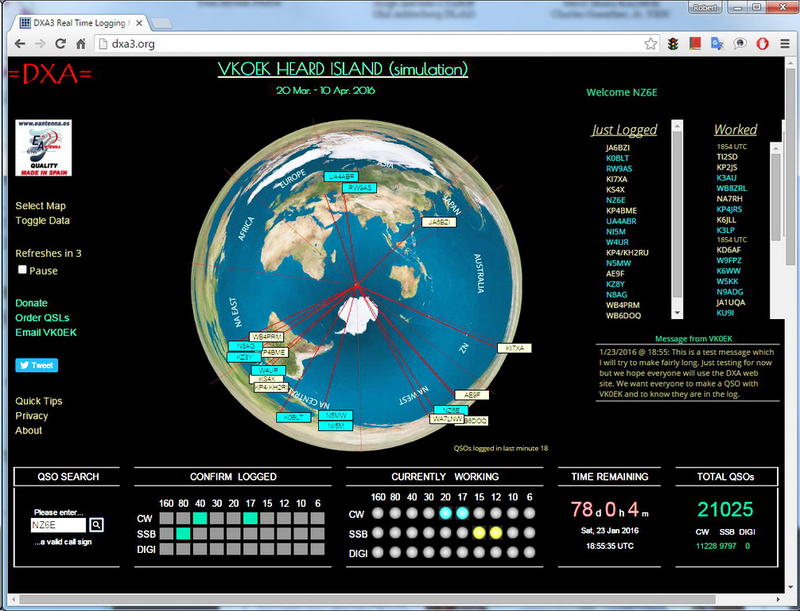 =DXA= is the most powerful tool to help DXers make a confirmed contact with the DXpedition. It provides an effectively real-time web browser page that automatically updates to give confirmation of the successful contact. This enables a DXer to get confirmation of a valid contact while there is still time to correct a mistake (e.g., the operator mistyped the callsign), i.e., it totally eliminates the need for duplicate contacts and the threat of pirates. It also provides an extraordinary supplementary experience for the DXer–he has the sense of watching the action, and even participating. We also believe it will help to reduce the anxiety and deliberate interference on the air that has become more common recently. Can I see a simulation of DXA now?
. This is the development site for =DXA= (version 3). This site is currently running a simulation, but will be restarted and go live once the team is on Heard Island. Where will I find DXA during the VKØEK DXpedition? Where can I learn more about DXA? A complete description of =DXA= is provided by the book DXA: The Real-time Online Radio Log Server, by Robert W. Schmieder, KK6EK. You can order a copy ($25 ppd) from Cordell Expeditions (address below).